Goodbye clear drinking water, hello disease? 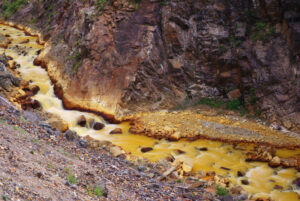 An “accident” by an EPA cleanup crew earlier this month released an estimated three million gallons of contaminated water from the Gold King Mine into Colorado’s Animas River. Scientists are calling it one of the biggest economic disasters to strike the Southwest. The breach occurred earlier this month and as of August 8th remained unchecked. Last time we checked, the gold mine was still belching over 500 gallons of contaminated water every minute into the Animas River. The once pristine Animas River has transformed into a sickening orange sludge that could affect millions of people if allowed to reach the Colorado River. The muck contains dangerous metals like arsenic and lead that could spell disease for humans and death for animals. It has already reached New Mexico. If action is not taken, that pollution will continue to flow into the San Juan River and then into the Colorado River and Lake Powell – a reservoir that provides drinking water for 20 million people. It is by very definition the responsibility of the Environmental Protection Agency (EPA) to ensure this sort of thing doesn’t happen. The EPA is calling the incident an “accident,” but disasters of this magnitude are rarely mistakes, especially disasters that could have been so easily avoided. And the EPA doesn’t seem to be in a hurry to fix the problem. “There’s not a low we can do,” said EPA director Don Cooper. We can keep people away and keep testing. We still don’t know how bad it is.” Keep in mind the EPA just snatched all of our country’s waterways. In an unprecedented power grab earlier this year, the Obama administration granted the EPA power over every single waterway in the U.S. How can we depend on an agency that is not only failing to protect our environment, but actively destroying it? Better stock up on water purification supplies, because according to the new law, the EPA even has power over ponds and lakes on private lands!